Knitting on the Canyonette Shawl continues and is nearing the end. All in all, it’s been a great project for the knitting break I needed. Now it’s back to the hard work. I am being haunted by Ming Blue. Though it doesn’t exist in knitted form any longer, I feel I need to justify why it doesn’t. In truth, if I had known I’d feel this bad, I wouldn’t have killed it. Instead I would have folded it up and put it away. Lesson learned. Yes, Ming Blue came out looking very much like what I imagined in my design. Though I changed the cuffs from the initial drawing, I was still liking the overall form. I felt the clean, close line of the knitted cuffs worked well with the shape of the mandarin collar. The gentle blouse shape of the sleeves above the cuffs went well with the A-line body shape. The overall effect was one of an artist’s smock circa 1960s kind of thing. The patch pockets were and integral part of the smock-child-1960s look. So what didn’t I like? Where did the prototype fail? Color. I have no yarn stores near me, so every yarn I procure is via the internet. In turn, I very much depend on the colors being what they look like on screen. 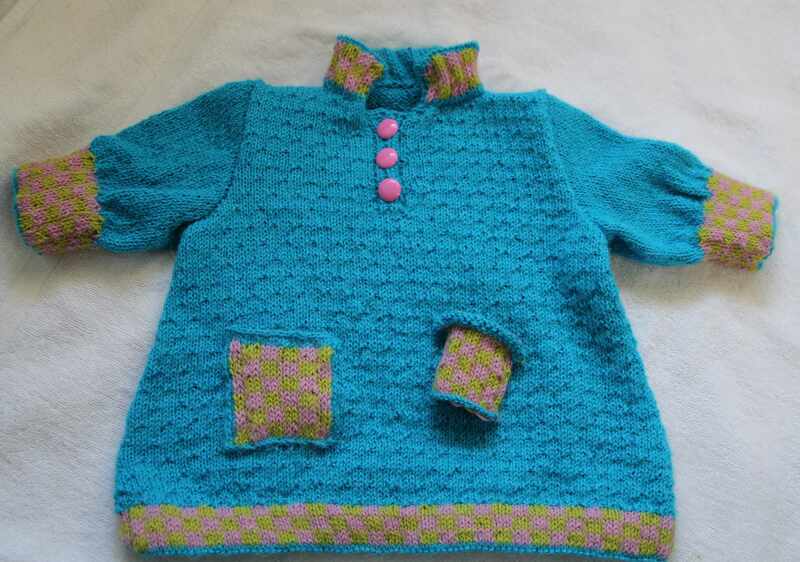 If I had been able to hold the turquoise, lime green, and pink yarn next to each other in my hands, I would have seen that the pink had a bluish cast that when put next to the lime green deadened what should have been a pop, vibrant splash of color. As one who paints in acrylics, I am used to mixing my own colors to get the right one, so it really bothered me that the bluish cast of the pink killed the vibrancy of the lime green. The pink needed to be more toward the red / yellow area of the color wheel. While the right orange would have been a perfect color triad, I wanted the retro look that a bright pink would bring. To off-set this problem, I tried to work the checkerboard with turquoise separating the pink from the green. Since a color is greatly affected by those that surround it, the separation made the pink pop and it lost it’s bluish cast. It also made the lime green pop. However, I was not happy overall with the way the checkerboard looked with the turquoise separating the colors. I wanted edgy 1960s, not something off the farm from Iowa. I used a slipped stitch pattern to create the checkerboard with the turquoise separation and I liked the way it looked on the reverse side as opposed to the stranded method I used originally. With the slipped stitch pattern I wouldn’t need to create facings, except perhaps around the neck, because the floats were not too exposed. The second thing that killed the design was the facings. Knitting a facing and then properly sewing it so it covers the float area but does not affect the drape of the hem, cuff or neck on the right side takes time and patience. I want knitters who buy my patterns to enjoy creating their projects. I want them to like the project as much when they finish it as they did when they started it. Sewing facings is fiddly work. While I don’t mind it, I can see where it would not be a hit with all knitters. I could see them jettison the facings altogether and their end product would not be the nice, neat looking garment inside and out that I had designed it to be. Thus, they would not be happy. The third thing to kill the design was the buttons and their placement. It had a clown costume feel to me that I just couldn’t get beyond. If I changed the neckline I could have rectified this, but I wasn’t willing to make that change. The more I thought the more I realized the mandarin collar had become the main point for me around which I was designing and not the 1960s look that I first zeroed in on. And so there will be two sweaters coming out of this attempt. 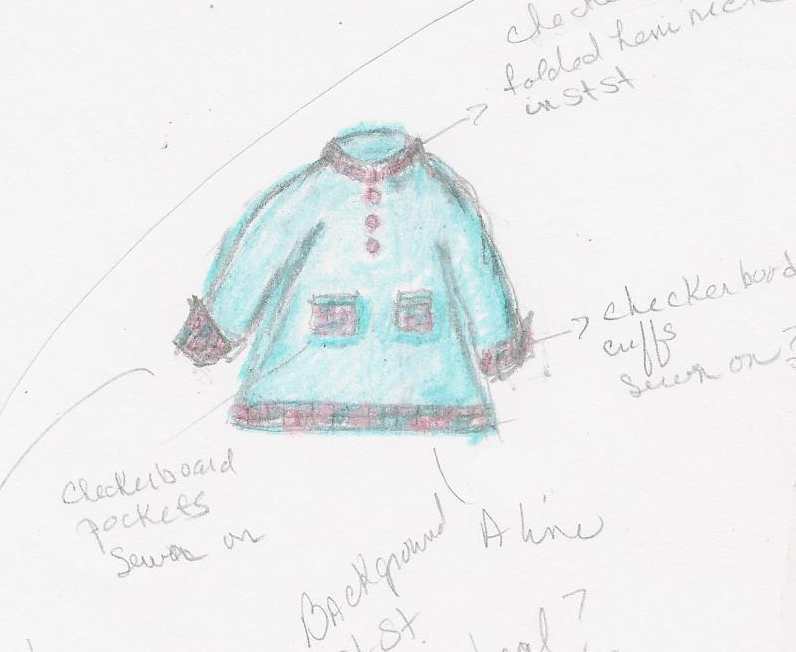 There will be a 1960s child’s smock and there will be a mandarin collared garment with clean lines and frog closure. The latter garment will be named Ming Blue Too. I completely understand your dilemma with the tones and hues of colour – it makes such a difference to anything! Relying on a colour being true to a photograph and a screen resolution is tricky business indeed! As someone who also buys yarn online, I understand the problem (though I still love your finished smock). Quite often I look at yarn on the seller’s website, then look it up on Ravelry to see photos of it in people’s stashes and in their finished objects. Then I take a sort of mental average of the colours to guess what the actual colour is. It sort of works… most of the time. But it’s tricky. I do like that vibrant blue, by the way. And your design. I think it is a shame that there are no LYS near you! Here I live in the back of the north pole, and have many I can get to within an hour. So I can see and touch the yarn, and remember it for when I want to buy it. Do the shops you buy from online offer swatch cards? I know Halcyon does, but don’t know if you shop there. It is a shame to have the yarn color ruin a good design. Can’t wait to see the good that comes of it, though. Thank you. Yes, the smocks have the scooped necks that work so well with them and the mandarin goes more with a tailored look. Thank you. And that is a great suggestion to look a yarn up on Rav to see the different photos of it. The blue yarn is going to be kept as well as the A-line style. The collar area and the cuffs will see changes. The cuffs will come closer to my original idea of being turned back, having a bit of wing tip on them and held together with a button. The closest yarn store to me is in New York City and I’d rather be drawn and quartered before I travel into and then around streets down there. The other closest is Webs in Massachusetts and that’s 2.5 hours one way. If I have the energy I’d rather go to MA than NYC. That is amazing to me, that those are your choices. What is wrong with the entrepreneurs in the Hudson River area? I’d choose Webs as well! It is on my bucket list to get there someday. It is a bit farther than 2.5 hours – maybe 5 or 6, I would guess. But someday I will do it!